Losing weight can be difficult, especially if you have trouble burning fat. Exercise is a key component to weight loss and fat burning, but there are natural fat burners that can assist you in your efforts. Several foods can naturally rev up the metabolism or take more calories to digest than to burn. Don't overlook the importance of drinking eight glasses of water daily, because it can stimulate metabolism. Ice water burns slightly more calories than water at room temperature, because your body expends energy warming it up. Eggs are high in protein, which makes them a natural fat burner. Protein takes a lot of energy to digest and also helps you feel full between meals, which helps you maintain a weight loss diet. Eggs are no longer implicated in elevating cholesterol levels, but health-conscious people with concerns can omit the yokes and still enjoy the protein-rich egg whites. Oolong and green tea can increase metabolism. Both teas contain polyphenols, which might help suppress the enzymes that build fat. Green tea also contains epigallocatechin gallate, a phytochemical that seems to prevent adipose, or fat, cells from enlarging. However, the NYU Langone Medical Center cautions that the fat-burning abilities of tea require further testing, and that existing studies have yielded mixed results. 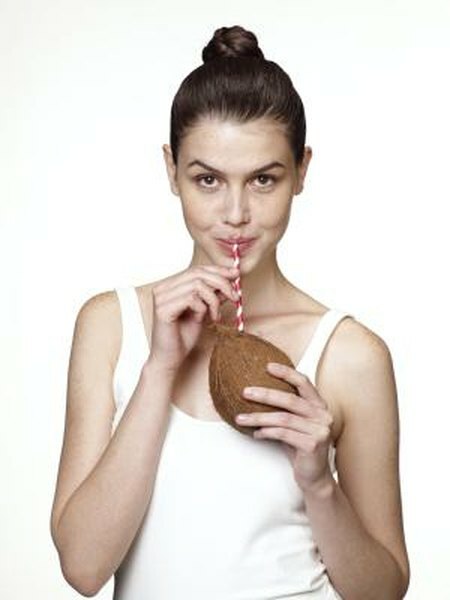 Coconut oil can be a valuable addition to anyone's diet, but especially for someone wanting to burn more fat naturally. Most types of fats are long-chain triglycerides, or LCTs, composed of six to 12 carbon chains. The more carbon chains, the more difficult it is for the body to digest. As a result, the body often stores LCT fats. Unlike LCTs, coconut oil is composed of medium-chain triglycerides, or MCTs that quickly break down in the body. These MCTs are readily absorbed for energy while causing you to burn LCTs. It might seem contrary to consume fat to burn fat. You might assume MCTs would increase your cholesterol levels, but a study performed by the University of Kerala, in India, found coconut oil actually lowered "bad" cholesterol levels. Hot peppers, like cayenne or chilies, contain capsaicin. A thermogenic substance, Capsaicin stimulates metabolism by increasing the core body temperature. Black pepper also speeds up metabolism, because it contains piperine, which also works thermogenically. Fiber helps you feel full longer, slows digestion and reduces hunger. While this might not directly burn fat, it can still help you to lose weight by reducing your chance of over-eating. You should consume at least 25 grams of fiber each day, or 14 grams per 1,000 calories in your diet. High-fiber foods include artichokes, quinoa, brown rice, figs, pears and almonds. Beans also have high levels of soluble fiber. They can lower insulin levels, which helps suppress appetite. Two cups of beans provides 25 g of fiber, and there are several varieties from which to choose, including pinto, kidney, navy and lima. Not all beans are good to stimulate fat burning. Baked beans are usually high in sugar, and refried beans often have high levels of saturated fat.